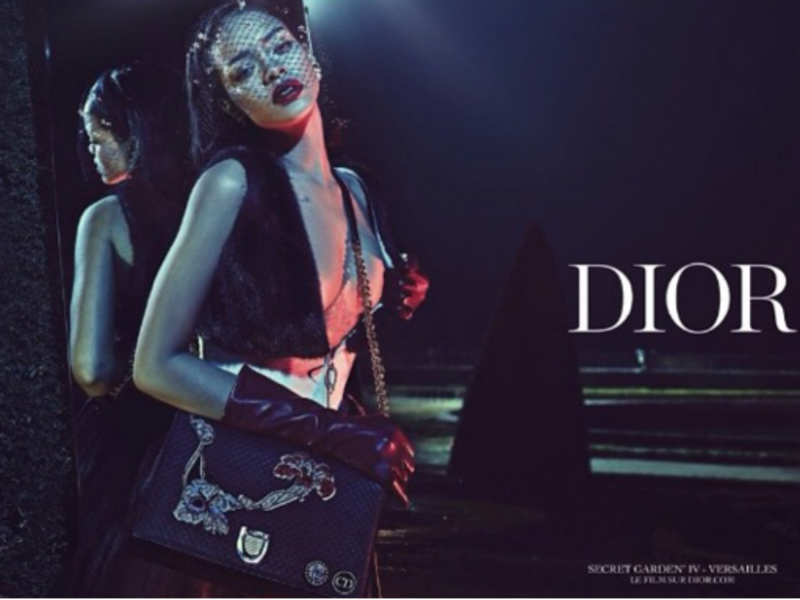 Rihanna has just released on her instagram the first images of her in Dior’s stunning new “Secret Garden” ad campaign. Check out the pictures here. And yesterday Rihanna shared with her 18.7 million instagram followers the first set of images of her starring role in Dior’s latest “Secret Garden” campaign (to view all the pictures click through our picture gallery above). The pictures, shot by Steven Klein, were taken in the ultra luxurious location at the Palace of Versailles in Paris. Rih Rih looks absolutely stunning in a series of three sultry, goth-glam looks. With one snap showcasing an uber glam, low-cut black dress (and exposing a glimpse of one of her tattoos), paired with an intricate black, beaded veil. And in another, the singer is channelling the ‘more is more’ vibe – in a high-neck sequin dress, holding 2 metallic handbags paired and donning some seriously cool sunglasses (want.need.now). And of cause finishing off the look perfectly with her trademark beauty look – a bold red lip.